Affording college tuition is a top concern for many families with high school seniors approaching their freshman year of college. But increasing your odds of funding your child’s college tuition with a lucrative financial aid package requires taking certain steps — many of them early on in the process. The Free Application for Federal Student Aid (FAFSA) is the document that most U.S. colleges use to determine how much financial aid to provide to students. To be considered for financial aid, your child must submit the FAFSA financial aid application between January 1st and June 3oth — the sooner the better. However, many states and colleges have earlier deadlines for applying for state and institutional financial aid, so it’s important to check with your child’s college choices about these deadlines. Financial Aid Tip #1: File your application early! Some schools and at least seven states — Illinois, Kentucky, North Carolina, South Carolina, Tennessee, Vermont, and Washington — award financial aid money on a first-come, first-served basis until financial aid funds are depleted. Late fall is a great time to get started filling out the FAFSA application so it is ready to go at the first of the year. Financial Aid Tip #2: Get an early estimate of your taxes. The FAFSA asks for your tax return information. While it would be ideal to file your taxes first and then use the information for filling out the FAFSA, you may not get your tax return information until the end of January. To file your child’s financial aid application as early as possible, the FAFSA provides estimate fields on the form. Simply come up with an estimate of your tax information using your last pay stub and last year’s tax return. The important thing is not to wait until you have final information. If your teen will be going to a school that follows the first-come, first-served way of distributing aid mentioned above, getting that application in early can make a huge difference. You’ll have the opportunity to go back and fill in correct information once your taxes are filed. Financial Aid Tip #3: File an application no matter what. Even if you think your family income is too high to receive financial aid, apply anyway. You might be surprised at how much your child qualifies for. The FAFSA is required not only for federal aid, but also for most aid awarded by states and colleges, which may have different need requirements. Financial Aid Tip #4: Open a 529 account for your child — as early as possible. Putting money away for your child’s education in a 529 account has multiple benefits. Though you do pay income tax on the money when you earn it, you don’t pay taxes on the interest it accrues over time. Depending on when you start and how much you contribute to the 529 account, it could earn thousands of tax-free dollars for your child by the time she gets to college. 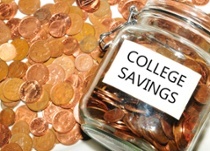 And, for some parents, having a regular deduction from their paycheck into the 529 account makes saving for college easier. Check with your financial advisor or search reputable online sources for more information. Financial Aid Tip #5: Include a letter explaining any extenuating circumstances. Although the FAFSA financial aid application asks more than 100 questions, no space is reserved to explain a specific situation that may affect finances, such as a recent job loss or high medical bills. You want financial aid officers to see the whole picture of your family’s financial situation. Just remember that it’s important to provide documentation from a third party to back up your claims. As you and your child prepare to fill out financial aid forms, keep time management in mind. It takes a while to get all of your information together, so give yourself plenty of lead time. Exercise caution when you fill out the form so you don’t hit the “send” button too soon. Fill out the form completely and review it a few times to ensure you have included all the information necessary to receive a great college financial aid package.